When I was in the fourth grade, I was in the school-wide spelling bee. I had dutifully studied my Paideia (the study guide that contains 3,300 beginning, intermediate, and advanced words for use in school, county, and state bees) and used flashcards to further burn the memorization into my brain. On the day of the big event, all of the participants and various family members gathered in the gymnasium, the all-purpose dome where everything from gym to lunch to school converts took place. Both my mother and my father had left work early to cheer me on, and I waved to them in the crowd. One of the youngest and tiniest children there, I was terrified, giddy and couldn’t wait for the whole affair to begin. Aaaargh! I knew right away that my proclivity to confuse the letters G and J had trumped me. And in the first round, too! 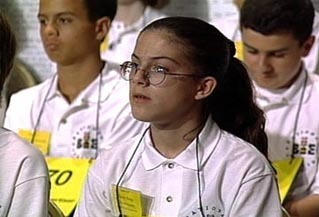 Perhaps it is the vividness of this memory that caused me to be so completely compelled by Spellbound, a movie that celebrates the “smart kid” by presenting the stories of eight different participants of the 1999 Scripps Howard National Spelling Bee. All come from widely varying backgrounds and upbringings, with each story presented so well that it’s next to impossible not to root hard for each and every one of them. First off, there’s Angela, a self-studier from the Texas panhandle. Her spelling success is all the more remarkable because neither of her parents speak much English, as they are Mexican immigrants who came to the U.S. to find better lives for their children. With all the support of family, friends, and her hometown, she wins her regional bee and sets off for Washington, D.C. with her parents for what will be their first trip to the nation’s capitol. An upbeat and positive kid, she’s used her own resources to excel. Next is Rolla, Missouri’s Ted, a quietly intelligent boy whose family has recently relocated to the small suburban town. He’s much different from the other 40 kids in his class, as he cultivates his mind and concentrates on studies while his schoolmates focus on basketball and other sports. A product of a supporting family, including vividly likeable parents and two brothers, he seems to spend less time studying than many of the national bee participants, relying instead on his own innate abilities. Nupur is returning to the national bee after having been eliminated the previous year in the third round. Though her parents understand that balance is important and recognize that it’s not even that important she be the “very best speller,” she is determined to win, which is illustrated with interviews from three of her regional competitors. A contestant who spells the words out on her hands for mental stimulation, she is a daunting contender. The oldest daughter of a single mother in inner city Washington, D.C., Ashley is a spirited and determined youngster who looks to faith and prayer for motivation. She hopes to have a good job that she enjoys someday so that she can have a house and give something back to her mom, who is very proud and supportive. Hailing from New Haven, Emily fits in preparations for the bee between equestrian practice and singing in a school choir. She’s been to the national bee twice before and placed tenth in 1998, making her one of ESPN’s favorites to win. While in the past she’s brought her au pair as a guest, her mother will be in the audience cheering her on this time. Neil is the son of an East Indian family living in San Clemente, CA. His father is extremely driven and works with his son to practice every word ever given in past bees. Neil even has various coaches that work with him to optimize his performance, including one that focuses on the French language only and one that concentrates on Spanish words. His grandfather in India has paid 1,000 people to pray for a win, and will pay an extra 5,000 hungry families if Neil emerges as grand champion. Then there’s April, a teenager who studies her dictionary and study materials up to nine hours a day. Her parents are very supportive and are adorable to watch as she works her way through the rounds at the national bee. April compares them to Archie and Edith Bunker, but the honest evaluation is that they’re sweeter than that by far. Finally, we meet Harry, who is nearly impossible to describe in words. Suffice it to say that he’s very unusual and a riot to watch. It might seem as though that’s just too many people to keep track of, but instead the viewer becomes emotionally invested in all of their outcomes. After the film spends a decent amount of time introducing the audience to each of the featured contestants, there’s reason to want each one to come forward as the winner, so the odd result is that one roots for multiple protagonists with the only real conflict being the battle vs. the words themselves. Probably much of the ease in rooting for all these kids is that they’re real. Spellbound is a documentary, after all, with stories about actual people and honest events. Yes, the movie is very optimistic and presents most everything in a very light manner; however, there are occasions when some of the kids’ stories elicit sadness; these are children so dedicated to their causes that they are perhaps forfeiting a piece of their youth for the big prize. They’re really not unlike Olympic athletes training for the greatest event of their lives, which certainly requires some amount of sacrifice. But even though each child is highly competitive and wants to win more than anything, they’re all refreshingly supportive of one another. When it’s time for a new round, hugs are exchanged all around, and discussions about strategy and various words take place. The film flows quite seamlessly thanks to director Jeffrey Blitz’s conscientious editing and effective uses of music and silence. The audience feels every bit of the tenseness and anticipation that the children and their families do as the various spellers step up for their turns. By the time we learn what “banns” means and see the champion correctly spell “logorrhea,” we’ve made a connection with the participants, spelling each word along with them. We rejoice when they’re correct, and we moan when they misstep. It’s a sublime little film, and it made me look forward to watching next year’s actual event. Obviously, I give Spellbound a strong recommendation, and note that families shouldn’t be put off by the fact that it’s a documentary. It’s a wonderful film for all ages.